What is fascinating with Street Art is that you might not be aware of it but when you begin to see it, it does not stop appearing in front of your eyes. 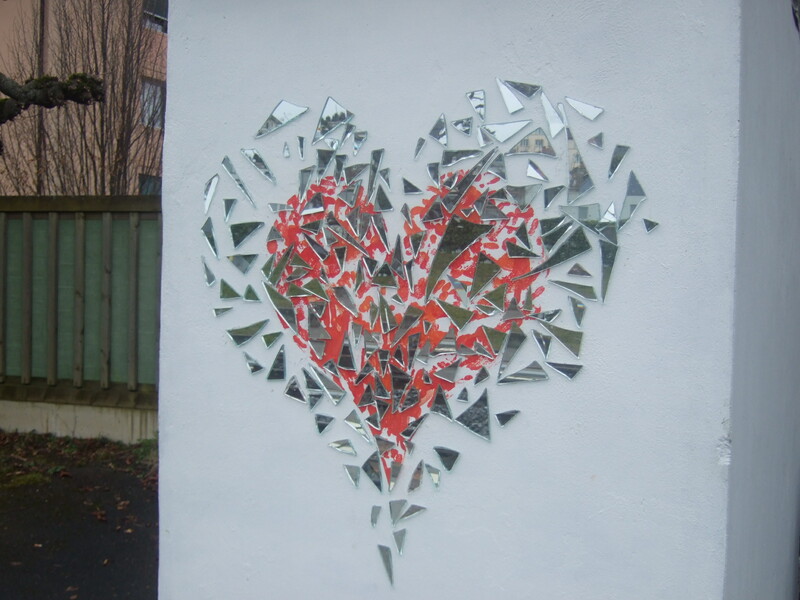 After following Banksy in New York and then discovering Space Invader’s work in Switzerland (Lausanne, Geneva and Bern), a colleague mentioned to me the poetic mirror mosaics in Pully. I spent a few hours walking around and they blossomed everywhere! The beauty of life also comes from chance as Paul Auster artistically expresses it in his novels (check The Music of Chance). While I was taking a picture of one of these mirrors, someone behind me asked “So you like my snail?”. It was “Mirror Mosaic Man”. We had a short chat. 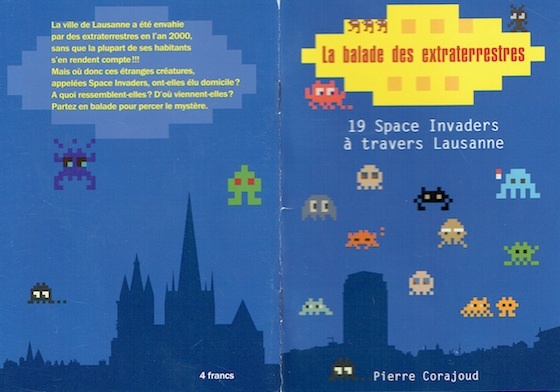 I mentioned Space Invader in Lausanne and Pully’s artist told me I should contact Pierre Corajoud who publishes very nice little books about walks around Lausanne. Pierre Corajoud had indeed published a small booklet about Invaders in Lausanne. I thank him here again for offering me a copy because unfortunately, many works have been destroyed or stolen after its publication and Corajoud took his book out of the shelves. A pity! I hope the mosaics will not disappear… Here is the map though. Finally here is a pdf document with all the works I saw or found online. But the best is to go and find them directly on site! This entry was posted in Must watch or read, Street Art and tagged Art, Corajoud, Mosaic, Pully, Space Invader, Street Art, Switzerland on February 8, 2014 by Hervé Lebret. I am far from the first one to do this. For example Alain Hubler blogged about it in 2007 and helped me in finding the final place I was struggling with (thanks!) And I nearly know nothing about Street Art. But it was fun to look for his work. As a strange coincidence Xavier Delaporte on French Radio France Culture had an interesting chronicle last Friday about our new ways to walk in the street in the Internet Age, Les nouvelles façons de marcher (avec nos outils numériques) This is just another example! Space Invader, just like Banksy and many other Street Artists, remains anonymous. He has his own web site, www.space-invaders.com. He has his fans like Monsieur Chat who follows his production in Paris and many others who put pictures of his work online. Unfortunately, most of the work has disappeared, either the buildings have been destroyed, or the art has been stolen and/or replaced by others. There is also a second artist, Spaceramik, who put his own video on YouTube. The picture I put above might not be from Space Invader neither from Spaceramik, hence the term “unidentified”. A final point here is the Google Maps of Invaders in Lausanne. Pierre Corajoud is famous in Lausanne for publishing very nice little books about walks around Lausanne. 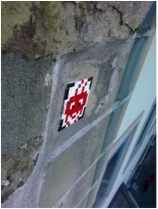 I learnt through Mirror Mosaic Man that he had published such a booklet about Space Invader in Lausanne. I thank Pierre Corrajoud here again for offering me a copy of his book because unfortunately, many works have been destroyed or stolen after its publication and Corrajoud took his book out of the shelves. This entry was posted in Must watch or read, Street Art and tagged Art, Banksy, Corajoud, Space Invader, Street Art, Switzerland on December 15, 2013 by Hervé Lebret.